Why freeze your buns off in Times Square for free on New Year's Eve when you could pay $400 to party at Olive Garden? Olive Garden is one of several chain restaurants in Times Square selling tickets for New Year's Eve. $400 buys a five-hour party, starting at 8 p.m., with a full buffet, a DJ, dancing, "multiple open bars" and a champagne toast at midnight, according to the Italian-style eatery. The menu includes chicken con broccoli, eggplant parm, shrimp primavera, short ribs, chicken marsala, mashed potatoes and garden vegetables. A spokeswoman for the restaurant that's famous for its bottomless bucket of breadsticks initially said there would be no breadsticks on New Year's Eve. But she later said she "misspoke" and said that, in fact, breadsticks will be available. But there's a catch to the party. 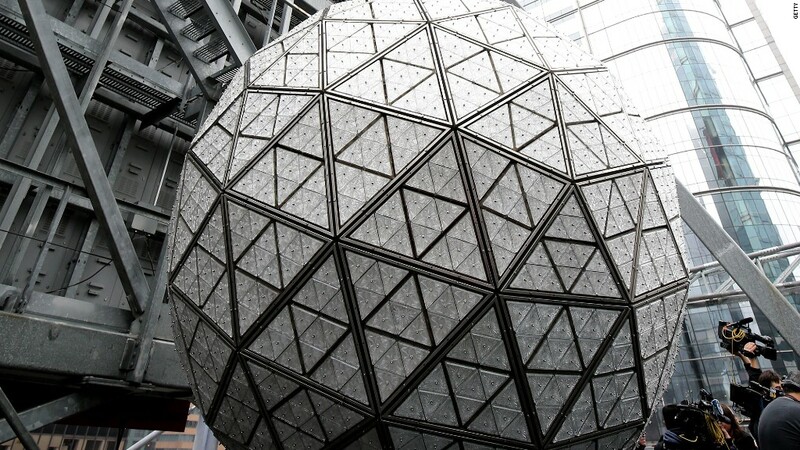 "A view of the ball drop is limited," the company said, referring to the world famous 12-foot crystal ball that descends at midnight. "With the cooperation of the NYPD and security, we are hoping to get to see the ball drop from just outside our front doors," said Olive Garden. "But due to security issues we can't sell the tickets on the premise that outside view of the ball drop is guaranteed." Also, smoking is off limits -- inside or outside the restaurant. "You will NOT be permitted to leave the building or step outside for a cigarette," said Olive Garden, which owned by Darden (DRI). And wear a nice shirt please: no T-shirts or sneakers allowed. Diners are seated first come, first serve, and then it's standing room only. Or ... you could save a few bucks and watch the ball drop from Applebee's. Applebee's, the family-friendly restaurant chain that typically charges $10 for a steak, is charging $375 for adults and $250 for children to watch the New Year's festivities from its perch on 42nd Street. That buys you an endless heap of food, an open bar and three DJs spread across three floors, starting at 7:30 p.m., according to a spokeswoman for the Times Square Applebee's, which is owned by DineEquity (DIN). Applebee's also offers a commanding view of the frozen crowds in Times Square, where thousands make the pilgrimage to stand around for hours, cordoned off by security fences, to usher in the New Year. "You get to look out over the lock down zone," said the spokeswoman. She said that some of the 400 tickets for the night are still available. "Most of our sales happen in the last two days before New Year's when all the tourists are coming to New York," she said. Not to be outdone, Bubba Gump Shrimp Co. is charging $799 for its New Year Eve's party. Tickets sold out in five days, according to the company. In addition to an open bar with spiked lemonade and alcoholic Sno-Cones, and a raw bar with caviar and lobster, guests will be served blackened salmon, BBQ short ribs and BBQ spiced shrimp and grits. The venue's view is a strong selling point, according to Jim Dufault, chief operating officer for Bubba Gump Shrimp. He said his restaurant is "one of the only restaurants in Times Square where guests can view the ball drop."